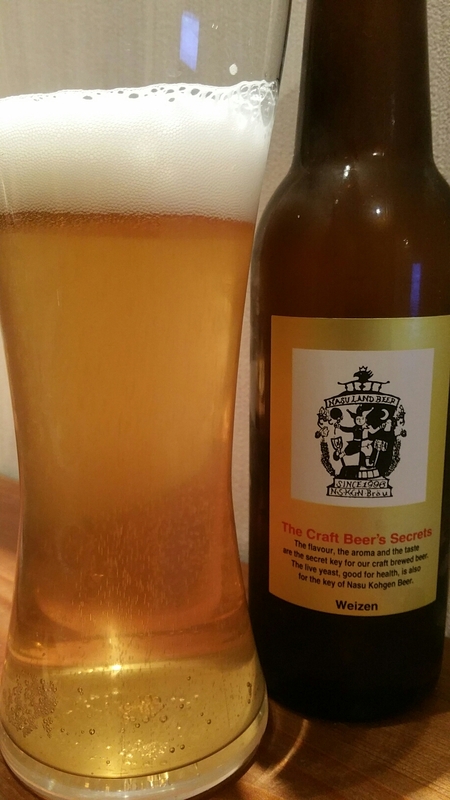 Nasu Kogen Weizen is a 5% German hefeweizen from Nasu Kogen Beer, from Tochigi. It’s part of their all-year round range of beers and is brewed using a traditional recipe from the Bayern region of Germany and also uses ingredients from that area. Nasu Kogen Weizen won the gold medal at the 2001 International Beer Cup though thankfully that isn’t emblazoned on the side of the bottle. Fluffy head on top of a rich bananary [sic] body. Thankfully in winter, the BeerTengoku beer cellar under the house manages to keep all of the beers at perfect storage temperature though the only problem with that is the beers take a while to warm up. Ice cold beers are good on a summer’s day but not in winter as the aromas and flavours become heavily muted. Nasu Kogen Weizen was very much the same and it really needed time to warm up, though when it did, it had a lovely wheaty aroma with lashings of banana and some spice in there to. It poured out a golden amber colour with a medium amount of fluffy head but that was more than likely due to it being cold when poured. The body of Nasu Kogen Weizen was as far sweeter than the aroma had led me onto believe as it reminded me of those little foam banana sweets I used to have as a child. While they were nice, four or five were more than enough to satiate my sweet tooth, and that unfortunately is the same with Nasu Kogen Weizen. It started off well, but in the end, it was too cloying to drink quickly or in large gulps. There was some clove-like spice to it in the aftertaste but by that point I had had enough of it. Nasu Kogen Weizen is a nice weizen and shows what a weizen should taste like but the flavours need toning down to make it enjoyable.